Scott Appleton and Sheila Torres-Blank, who've been racing together for a couple years, invited me to race on their team "Run Amok" for the Steel Sports Pain in the Pines race on April 24th. We've all known each other for quite a while, but this is the first time we'd ever raced together. In past adventure races, they would generally finish somewhere around mid-pack. As we did a long workout together a week before the race, we talked about ways that they could improve. I'd always thought that they had the potential to finish in the top ten in the local Texas races, given their athletic abilities, experience, and nav skills. So I was curious to see if I could help them achieve some of their potential. Since they were looking to improve their race techniques, they gave me permission to be the main navigator during the race, and to be the "Transition Nazi", which meant that I could yell at them to get them moving quickly as we changed from one race discipline to the next. Fortunately I never actually had to yell at them during the race, as just constantly reminding them we needed to get moving seemed to be enough to instill that low-level sense of urgency that makes for efficient transitions. The weather forecast called for dire amounts of rain, but fortunately the rain held off while we setup our tent and transition area canopy. They'd brought a handy folding table along for plotting the checkpoints on the map, which was good. They also brought handy folding chairs, which I informed them was actually a bad thing. I asked them "why do you need chairs in transition? ", and the answer was "well, to sit down, of course", and my follow up question was, "well, why do you need to sit down in transition?" The point was made that transitions should be a whirlwind of efficient activity. Sitting down makes you TOO comfortable, and causes you to lose the sense of urgency you have while you're racing, so your transitions take longer than they should. They were warming up to this idea, and realizing that it was possible to do most transitions in a couple of minutes, or even less. At least they'd already figured out that bike shoes were generally a bad idea for short races... the time spent changing shoes is time that you have to make up out on the course. As expected, the rain started pouring down as we slept in our tent. When morning came, it showed no signs of letting up. Teams gradually accepted their soggy fate and stepped out into the rain to get their gear ready for the race start. Everyone was moving slowly. Rodney Skyles, the race director, had to make some last minute changes to the course, since the park wouldn't let us use the mountain biking trails in the pouring rain. So, we got word that the race would start late. Everyone huddled around and tried to stay warm, and anxiously awaited the start. Finally, Rodney called everyone together for the pre-race briefing. We were near the back of the pack, and could barely hear him speak through the pouring rain, but we heard enough to gather that we would start the race with a trail run around the small lake, and then we would transition to paddling on the lake. Then, instead of the usual "be ready to start in ten minutes", Rodney announced that the race was starting... right now! Oh my, we weren't totally prepared for that, but a quick sanity check revealed that we were ok: Sheila and I were wearing our packs, and Scott could just borrow liquids from us for the short run and paddle ahead. So, we decided that we didn't need to bother with a quick detour back to our TA. That's the fastest kind of transition at all... the NO transition! Since we were lined up at the back of the pack when Rodney said "go", we pretty much were stuck at the back of the pack on the trail run. No matter, we wanted to run a bit slowly to loosen up anyway. It was good to finally be moving to get warm in the cold rain. The trail opened up wide in a couple of areas, so we eventually had some opportunities to pass and get ourselves closer to the middle of the pack. As we were running, I started thinking to myself how we'd handle transitioning to the next event. Usually we'd get the points for the boat leg, and then plot them on our map. As a general rule, you always want to plot the points yourself, and not rely on following other teams. Murphy's Law always seems to punish you by making the team that you're following get lost, and then you're stuck without even knowing where you're supposed to be going. However, I decided that this could be one of the exceptions to the rule, as all the teams would be finishing the run bunched fairly close together. The lake was small enough where there was no way we would be able to get lost (we hoped). I conveyed the somewhat risky plan to Scott and Sheila as we were running, and they agreed that it was worth the risk to just jump in the boats and play follow the leader. So, we did. I ran up to grab the instruction sheet, and as I ran back over to the boats I scanned it to make sure it didn't say anything out of the ordinary. Just paddle out and punch two checkpoints, no problem. So into the boat we went, even being so bold as to leave our mapcase on the shore. We were committed to the plan now! We followed after the leading teams, figuring that one of them must have plotted the points, and hoping that they got it right. Happily, the gamble paid off, and we cruised across the lake and back, finding the two points with no problems. I'm sure we weren't the only team to use this strategy! We pulled our boat onto the shore and ran to get the instructions for the next leg. It was a long navigation leg on foot, the "meat and potatoes" of adventure racing. Now THIS leg, we would definitely plot! We ran to our canopy, dried off the table with a towel, and Sheila helped me plot the points while Scott put on his pack and fueled up. We would have to find ten points all around the park, without traveling on the main park road. It was "rogaine style", so we could find the points in any order. We quickly chose an order that looked the most efficient (later we would decide that there was a slightly better order we could have taken, but this is one of those "too slow and careful vs. too fast and reckless" decisions), and headed off around the park in a counter-clockwise direction. CP 14 was up away from the TA in a big gully. We travelled up the gully, looking for the reentrant coming down from the left that would signal the checkpoint. Somehow we went past it, but we had a good handrail to let us know we went too far: the fence that marked the park boundary. Ok, no problem, we'd just turn around and stay above the gully and find the reentrant further downstream. Along the way we passed another team still coming up the same way we did, and it was obvious that they'd missed the turnoff as well. So, when we found it we quickly got out of the area so as not to give its location away. Jogging to CP 12. Stayed high for a while, then down into another gully, then through a flat area before heading up the other side. We ran into team Rattlesnake Racing, who were also headed to CP 12. They hadn't hit CP 14 yet, so we were ahead of them, but later we realized that getting CP 14 last made for a shorter route, so they were racing smarter than us. But, Jim McTassney started his team heading up what I thought was the wrong drainage finger to CP 12. I was sure we had to be further west, though it was hard to convince myself, as I know from past experience that Jim is a more consistent navigator than me. Jim and I made a short verbal agreement to signal each other if either of us found CP 12, and so our team crossed over to the west. Shockingly, for once I was more correct than Jim (that never happens), and we found the point first and then yelled back to team Rattlesnake to let them know where it was. On to CP 5, which I figured would be hard to mess up. Climb up to the fence corner, then turn down into a nearby gully and hopefully land right on top of it. The plan worked perfectly, so another one down. Our original plan was to then go to CP 7, then CP 6, then CP 8, but my eyes overlooked CP 7, so we wound up doing CP 6 before CP 7. Turns out that fortunately it wasn't a big deal, as the revised route was only slightly longer. But, we did have our biggest problems finding CP 6. We came down into the gully without being sure if we were above or below the point. I went downstream while others went upstream, intending to stay within sight of them while seeing if I could see the checkpoint farther downstream before turning around and rejoining the team. Somehow, I lost sight of my team, and wound up running in circles up and down the gully and reentrants trying to find them. It was definitely not our proudest moment. After much frenzied searching, I found my teammates right where they should be, waiting patiently for me at the checkpoint. Well, I was part of team "Run Amok" now, as I guess I'd done my share of running amok. Since we carry a GPS system throughout the race, it'll be fun to see the mad path I took on the Topo Trak later. We decided we'd be more careful about staying within visual contact. The rain was so loud that we couldn't hear ourselves yell to one another, so it was very difficult to find each other if we got separated. No more accidental separations! We headed down to CP 7, which we found easily enough by using a road intersection as our attack point. CP 8 slowed us down a bit, as the gully system confused me, but Scott came to my rescue and got us pointed in the right direction again. I was navigating with the usual topo quad, while Scott was navigating off of an orienteering map of Tyler State Park that Sheila had picked up at an O-meet a couple of weeks before. The orienteering map was more detailed than the topo quad, but the plotting system only worked on the topo quad, so we were using both, which wound up working pretty well. Also, the orienteering map didn't show the whole park, so we definitely needed to keep up with the topo quad, too. My nav again faltered a bit on CP 9, as we searched a couple of shallow drainages near a hilltop. This turned out to be an overgrown section of the park, with prickly vines. So after I bit of fighting through the brush Scott and I reconvened to compare maps, and Scott correctly determined the right way to the point. At least we were working quite well together... I could navigate faster than Scott and keep us always moving, but Scott was great at doing sanity checks and making sure that we were moving in the right directions. Hoowah! There was a nice trail down from CP 9 which wound up leading us right to CP 10. Gotta enjoy the easy ones! We were even able to jog down a dirt road on the way to CP 11. Then it was time to get on the trail by the lake edge where we'd run that morning, and follow the trail to the drainage leading to CP 11. Got it... only one more to go! CP 13 could be approached in a couple of different ways from CP 11. The most direct way involved traveling down a gully system. I decided instead to play it safe and approach it from up high from a good attack point, where a plateau ended up pointing right down to it. As we were heading down to it, we saw team Rattlesnake Racing coming back from it... obviously, Jim's more consistent navigation had allowed them to pass us while I'd been running amok back at CP 6, and we were only now just catching up from that mistake. We tagged our last point, CP 13, which I thought was at a higher elevation than I'd plotted it on our map, and headed back to the TA. I kept the team jogging when the terrain was open. Scott and Sheila admitted later that this addressed another of their weak points... they had a tendency to fall into "walk mode" during navigation, and then fail to switch back to jogging when the terrain was open and they knew which way they had to go. Fortunately, they seemed to be picking up on my philosophy about striving to stay in "race mode", and that motivated them to keep moving forward efficiently and quickly. We entered the TA, ahead of Rattlesnake Racing only because they still had to get CP 14, which we'd gotten at the start of the leg. Next up was a bike leg. It was all on roads due to the trails being so muddy after all the rain. The bike map was paper, and unfortunately the inside of my map case hadn't stayed completely dry, so the map slowly fell apart as the bike progressed. Luckily, I was able to memorize enough of the route, and there were arrows posted at (most of) the intersections along the way, so we were able to keep on course. We had already discussed exactly what we needed to do in transition as we were coming in, and since there was no plotting to be done for the bike leg, we got out of there very quickly. Kudos to Scott and Sheila for doing an impressively fast transition to the bikes! I think they just didn't want to have to listen to me nagging them that we needed to get moving again! The roads in the park were very hilly, but once we exited the park there was a big biking loop on mostly flat country roads. So on the big loop we hooked up so I could tow Scott's bike with an elastic line. It was a new experience for me... I've never towed anyone on a bike before. I still wouldn't be comfortable towing on trails, but on roads it was easy enough. Only about a mile out of the park, disaster struck as Sheila's bike lost a "pulley", which is a piece of the derailer section. Or so I gathered, as I'm completely clueless about bike maintenance. Sheila, however, is not, so she set about seeing if she could rig her bike so that it was at least ridable. I biked back slowly along the road, looking for the wayward bike piece, but found nothing except for cigarette butts and beer cans. When I came back, we discussed options: If the bike was unfixable, I could just tow Sheila through the leg. Going back to the TA wouldn't help, as they didn't have the needed spare part. Sheila was still hopeful she could fix it, so I munched on a trail mix bar while she worked. I suggested Scott eat something, too, which was when I realized that Scott was in a bad way. He was afraid his system would reject any food he tried to eat at the moment, and he was shivering with cold as we were standing still in the rain. So, while Sheila continued her MacGuyverish bike fixing, I hugged Scott to keep him warm. We must have been an odd sight to the passing cars. Happily, within a few minutes Sheila announced success! She had rigged it up so that she could at least ride, even if she only had three gears. But Sheila's an excellent biker, so three gears were more than enough for her to keep up with me towing Scott. We were off again, having only been passed by one team during the whole ordeal. Scott was just thankful to be moving again and slowly warming up. We came to a north/south intersection, and the bike arrow pointed south. Hmmm... that's odd, I would have expected to turn north, according to our rapidly disintegrating wet map. We went south about 200 yards, and didn't see any intersections ahead, so I had us stop and go back to the intersection. We saw some kids on bikes in the area, and asked them if they'd turned the sign around. They denied it. We got back to the sign and looked at it more closely... and saw that on the arrow was written "sprint only". Aha! There were two races going on simultaneously here, and we were doing the long course. We turned back to the north, lucky to have not been drawn down the wrong way for very long. Sorry to the kids for accusing them. The mid-point of the bike loop had a checkpoint at a church, and then we were halfway done and heading back home. The rain finally stopped at some point during the ride, and the sun even started coming out. What a relief for poor cold Scott! On the way back to the park, we passed the two person male team that had gone by us earlier while we were having bike problems. Then a neighborhood dog decided that we were its friends, and it followed us back into the park. We tried to tell it to go home, but we couldn't convince it that going home would be more fun than following us. Oh well, I just hope it eventually made it back safely. Scott still wasn't in top shape, having not been able to eat enough. He figured that mixing up an energy drink of "Spiz" in transition would help him out. As we finished the bike leg, though, we learned we had some special tests to tackle, so we decided to just do them first. Scott would have time to take care of himself later while we plotted the next leg. The first special test involved filling a big five-gallon jug with water from the lake using small cans. The big jug had to stay 30 feet from the water, so we ran back and forth with the cans to fill it up. Then the volunteers had us throw the water from the jug "as far as we could" over this grid of ropes that was raised a foot off the ground. After doing so, they told us "surprise! ", now you have to crawl through the water. Well, it's not like we hadn't been wet all day, anyway, so no biggie. Once through the other side, we had to walk back over the mesh keeping one teammate off the ground. So I piggybacked Sheila over the mesh, which again was no biggie for us. I'd have hated to be on a team with all large guys for that one, though. The next special test was really cool: A huge 4 foot by 6 foot puzzle that was cut out of plywood. It was fun to work with the oversized puzzle pieces. Scott and Sheila proved quite adept at this special test, while I floundered about trying to help without getting in their way. At the end of the test, they told us to scramble the pieces for the next team. I decided to be evil, and turned all the pieces upside down so they'd be covered in mud. 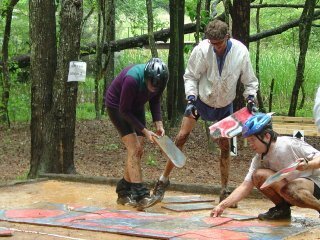 There was three sets of puzzles, and later in the race we came back and saw that the next two teams behind us had copied our idea and done the same thing with the other sets, and so all of the puzzles were so muddy it was impossible to see the painted pattern on them or tell which side was up. Then, I felt bad that we'd done such a mean thing. Does feeling bad about it make it ok? Probably not, I'm sure that I'm now damned to some level of Adventure Racing Hell. For all the teams behind us... I apologize for my evil treachery! And it was my idea, so don't be mad at Scott and Sheila! The final test to get out of the area was we had to go up the cool climbing wall. We were to pick a random colored block from a bag to determine which route we needed to take. Our luck was holding, as we picked the easiest of the three routes. As we got geared up to climb the wall, Rodney was in the area, and he mentioned to us, "I'm beginning to think y'all are good." I thought he was just trying to boost our spirits, because I thought our nav had been a little off, and with our bike problems I figured we were still mid-pack somewhere. So I asked asked him what he meant by that, and he told us we were leading the race. What?! We were winning? How'd that happen? Surely we couldn't be ahead of team Magellen GPS, I asked, and Rodney said they were way behind us after the nav leg. Oh my gosh. If we weren't psyched up before, we sure were now! We took turns zipping up the climbing wall, and then received the instructions for the next leg: Paddling again. This time, we HAD to plot the paddling points, as we now knew there was nobody else out there to follow! And we sure as heck weren't going to wait for another team to come along and show us the way! Sheila and I plotted the points, while Scott made his energy drink and tried to eat whatever he could to get his energy level back. The paddling leg was essentially the same as the morning, but in reverse. We dashed to our boats, yelling our "Run Amok!" as we ran by the special test area, where another team was going through the tests, right on our heals. Paddle, paddle, paddle. Scott and Sheila paddle well together, so even though we were in one of those plastic behemoth three person sit-on-top kayaks, we still made decent time. When we were getting the third lake checkpoint we could see our competition paddling towards the second lake checkpoint, but we figured they weren't moving any faster on the water than us. All we have to do is maintain this lead! We beached our boat and ran to ask what was next. It turned out to be a clockwise run around the main park road. We can do that! I conviced Scott and Sheila that we didn't need to spend more than a few seconds in transition, and that we could take care of ourselves as we walked. It worked out well, Scott carried his bottle of Spiz and drank the remainder of it as we kept making forward progress. Sheila's forte is biking, while Scott's is running, so Scott started feeling better now that we were on our feet, and was soon able to jog without any problems. I hooked up a tow line to help Sheila, and we chugged right along. We speedwalked the uphills, and jogged most of the downhills and flats. Sheila got a side stitch about half way through the loop, so we had to stop jogging for a while. But our competition was still nowhere in sight, so it looked like our pace might be enough. We started debating about whether this would be the last leg or not. I thought it was, based on the amount of time we'd been out of the course and the fact that the race had started late. Scott and Sheila didn't want to get their hopes up by thinking it was the last leg. So we decided to get mentally prepared for more biking, as it was the only logical thing that we might have to do next. As we finished the loop, Sheila's side stitch was clearing up, so she was able to jog again. Good, because if nothing else, you want to look strong when you come into the transition area! More furtive backwards glances revealed that the team behind us was still nowhere in sight. We jogged in, hoping for the best... and Yes! The race was over! We'd held onto our lead and won! Holy cow! After the race, we learned that the team behind us had walked the whole loop, and they wound up finishing third when team Magellan GPS jogged past them to take second place. Magellan GPS had had problems with navigating to CP 13, and we agreed with them that it was placed higher up than it was plotted on the map. The fact that we somehow managed to beat them, along with over 30 other teams, was simply unbelievable to everyone concerned. Racing with Scott and Sheila was a total blast, I'd do it again in a heartbeat. We all seem to share the same sense of humor and everyone on the team was always quick to help each other out when needed. And I found that it's pretty fun to Run Amok!